Man is built to seize. When Hughlings Jackson made this famous comment pertaining to the inherent hyperexcitability of the human brain in response to a wide range of different stimuli, he probably didn’t anticipate the mechanisms of splicing regulation. Our CNS is actively protected from hyperexcitability through directed splicing of ion channel mRNA. Now, a recent study in Epilepsia finds that these mechanisms may be dysfunctional in human epilepsy. The brain needs protection. There are several mechanisms in the brain that actively prevent hyperexcitability. One of them is RNA editing, a cryptic mechanism that prevents leaky glutamate receptors. For example, Q/R editing of the GluR2 mRNA is achieved through posttranscriptional A→I editing, changing the uncharged amino acid glutamine (Q) to the positively-charged arginine (R), preventing calcium ions from entering. A mechanism with a similar effect is splice regulation, a process that modifies the abundance of different protein isoforms. The RBFOX family. The RBFOX family of RNA-binding proteins specifically regulates splicing in neurons. Interestingly, splicing affected by the RBFOXes does not affect all transcripts, but specifically a subset of genes as identified through studies in knock-out mice. In the case of RBFOX1, these are mainly ion channel genes including GABRG2, SCN8A and CACNA1D. If RBFOX1 is not present, different isoforms of neuronal ion channels are spliced, turning the CNS hyperexcitable. Therefore, while not affecting ion channels directly, RBFOX1 defects affect various ion channel genes posttranscriptionally, resulting in a “meta-channelopathy” (please be aware that this is not a standard term, but was coined for this blog post to drive my point home). It is interesting to note that many ion channel genes possess a binding motif for this RNA binding protein, which makes you scratch your head as to what the evolutionary mechanisms might have been that have generated such an excitability switch. RBFOX1 deletions in IGE/GGE. Deletions or disruptions of the RBFOX1 gene had been reported sporadically in various neurodevelopmental disorders including autism. Now Lal and collaborators report on their finding in the EPICURE cohort of patients with Idiopathic Generalized Epilepsy (IGE/GGE). They identify deletions disrupting exons of RBFOX1 in 5 out of ~1400 patients. 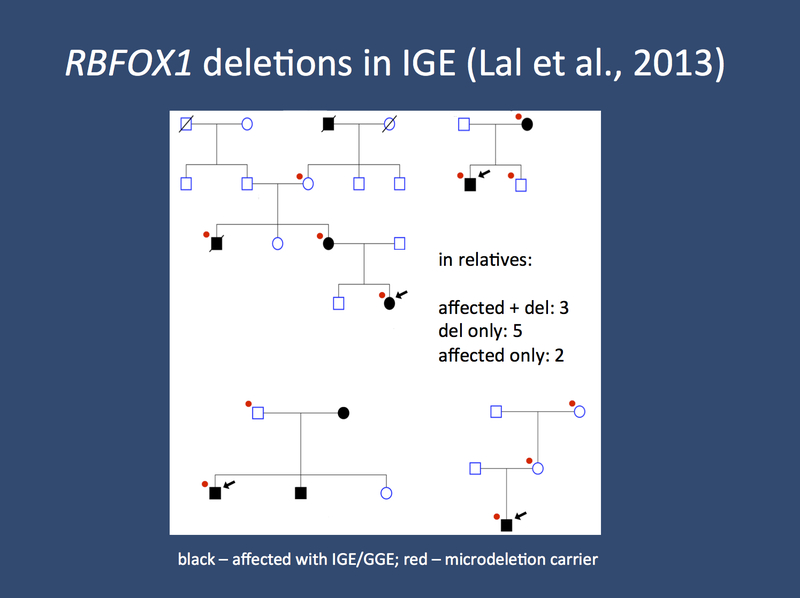 In almost 3000 controls, no deletions were found, suggesting that RBFOX1 deletions are genetic risk factors for IGE. RBFOX1 deletions had been found in individual cases with various neurodevelopmental disorders previously including autism and intellectual disability. Now this spectrum extends to the Idiopathic Generalized Epilepsies in line with the phenotypic spectrum observed for other “neurodels” including microdeletions of NRXN1 or recurrent deletions at 15q13.3, 16p13.11 and 15q11.2. Lost in translation. Interestingly, the deletions identified in the IGE patients do not affect the protein-coding region of RBFOX1, but are located within the untranslated 5’-UTR. This suggests that the gene that regulates so many ion channels is seemingly dysregulated itself through these deletions, which turns RBFOX1 into the first genetic risk factor for epilepsy that is located outside the protein-coding region. This phenomenon fits nicely with the upcoming theme of 2013, the slow shift of focus from protein-coding regions to regulatory elements. Inheritance. The inheritance pattern could be traced in 4/5 microdeletion carriers and 3/4 patients were from multiplex IGE families. However, segregation was incomplete and only 3/8 relatives (38%) carrying RBFOX1 deletions were affected. In addition, 2/5 affected relatives did not carry the deletion (40%). The RBFOX1 deletions affected different regions of the gene in each family. Therefore, the effect might be different in each family. However, at first glance, this lack of segregation contradicts the seemingly strong association found in the case-control design. This phenomenon has been observed with other epilepsy-related microdeletions previously and is in line with the behavior of genetic risk factors of the third kind, i.e. rare genetic variants in contrast to highly penetrant monogenic risk factors. Considering the attributable risk (0.3%) rather than discussing whether the phenotype of the patient is fully explained by the deletion might be a better way to conceptualize the effect of these variants. In 4/5 cases, inheritance could be traced in the family. In 3/4 families, additional family members were affected by IGE. Segregation was incomplete as previously observed in other microdeletions, which is in line with the behavior of rare genetic variants in families. Chipping away at the common epilepsies with complex genetics. The title of this 2009 review by Mulley and Dibbens came to my mind when I first saw the paper by Lal et al. The present paper mines existing data and thereby reminds us that even after the low-hanging fruits have been harvested, there is still a long tail of variants that will explain small but significant parts of the genetic architecture of IGE. My personal assumption is that these rare to very rare microdeletions may contribute another 5% of the attributable risk of IGE. Mining the existing data in the way that Lal and collaborators used the EPICURE cohort will turn up more variants in the years to come. This entry was posted in 2013, autism, EuroEPINOMICS, Familial epilepsies, human evolution, IGE/GGE, Papers and tagged A2BP1, autism, channelopathy, familial segregation, Genetic Generalized Epilepsy, Idiopathic Generalized Epilepsy, intellectual disability, microdeletion, RBFOX1, splice regulation, splicing. Bookmark the permalink.